We’re going to show you pictures and video of some Harry Potter icons located throughout the Harry Potter park and you can leave your guesses in the comments section, below. Over time, you can use this series to create your very own scavenger hunt during your next vacation to the Wizarding World of Harry Potter. I’ve created a new category, so you just need to visit the category page to find all the posts to create your hunt. We’re going to start with a couple really easy icons to find in the Wizarding World of Harry Potter, but they’re also two of my favorites. 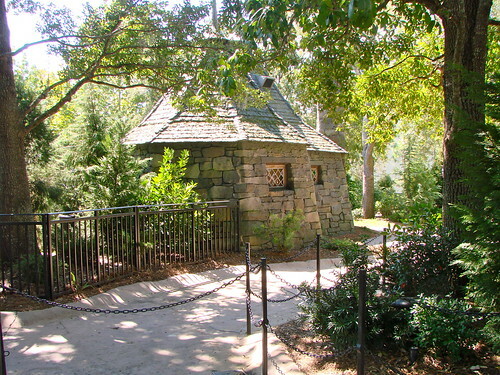 Hagrid’s Hut is one of my favorite buildings in the Wizarding World of Harry Potter, but I have one complaint. You can’t go inside! By the way, this is also a hint as to it’s location…. This is a picture of the backside of Hagrid’s Hut. It also gives a hint to it’s location. Buckbeak can be found very near Hagrid’s Hut, which makes sense since Hagrid cared for him, sitting in his nest. Buckbeak’s next is a magnificent structure with amazing detail! I could just sit and stare at it for hours! Unfortunately, you usually must keep moving when you get close to Buckbeak (hint!). Leave your guesses in the comments, below and we’ll update the post, later today with the official locations! UPDATE: Buckbeak can be seen in the Flight of the Hippogriff queue. Hagrid’s Hut can be seen from both the Flight of the Hippogriff queue and the Dragon Challenge queue.